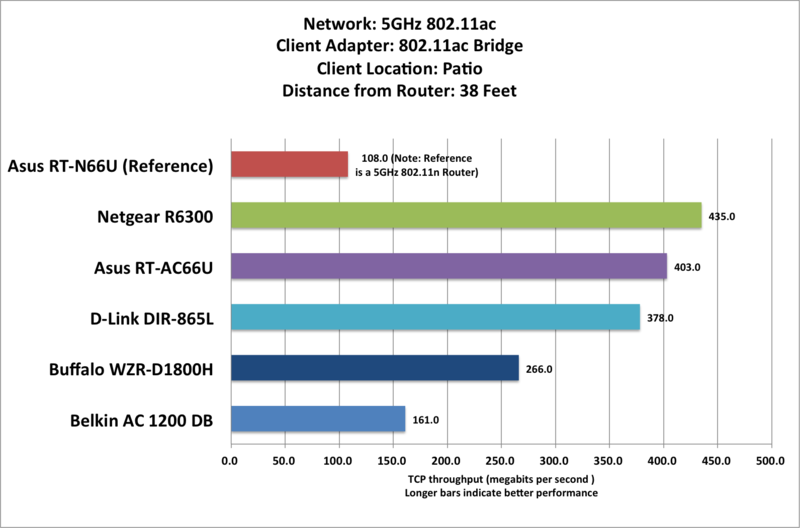 Buffalo was first to market with both an 802.11ac draft 2.0 router and an 802.11ac draft 2.0 media bridge to go with it. But I imagine that more than a few early adopters are gnashing their teeth over the fact that Buffalo has yet to release a firmware update to improve the pair's performance. The firmware available today is unchanged from when the manufacturer originally shipped the product. On the upside, the WZR-1800H's current street price ($160) matches that of Belkin's lesser AC 1200 DB router, and Buffalo's router supports three spatial streams on both the 2.4GHz and 5GHz frequency band, whereas Belkin supports only two streams on each band. What's more, Buffalo has been shipping a media bridge since its router launched, while Belkin has to provide reviewers like me with engineering samples and beta firmware. The WZR-D1800H comes with removable feet than allow it to operate in either a vertical or a horizontal orientation (in the latter case, the feet lift the router up, so that air can flow across both sides of its enclosure. There is no provision for wall-mounting the router. Buffalo built only one USB 2.0 port into the WZR-D1800H, so it can support either network-attached USB storage or a shared USB printer, but not both at the same time. I didn't try to set up a printer, and I couldn't measure its NAS performance because the router's firmware supports only drives formatted using FAT32 or XFS. High-capacity drives such as the 500MB Western Digital My Passport drive that I've been using to benchmark routers come from the factory formatted to use NTFS, and I'm not about to reformat it just so I can plug it into a router. Sorry, Buffalo, but that's a dumb oversight. The decision not to provide a guest network on either the 2.4GHz or 5GHz frequency bands is even more lame-brained. On the bright side, the WZR-D1800H provides a DLNA-certified media server, a Samba file server, and an integrated BitTorrent client that can download Torrent files without requiring you to run your PC. The router came from the factory set to operate on a single 20MHz channel on the 2.4GHz frequency, but it had no problem bonding two channels together to provide 40MHz of bandwith when I reconfigured its firmware. Even then, its TCP throughput left it languishing near the bottom of most of my charts (except on my close-range test, where it tied with the Belkin AC 1200 DB). The WZR-D1800H was configured for channel bonding on the 5GHz frequency band by default, delivering 80MHz of bandwidth in that spectrum. Here again, however, it finished last or next-to-last on most of my benchmark runs. 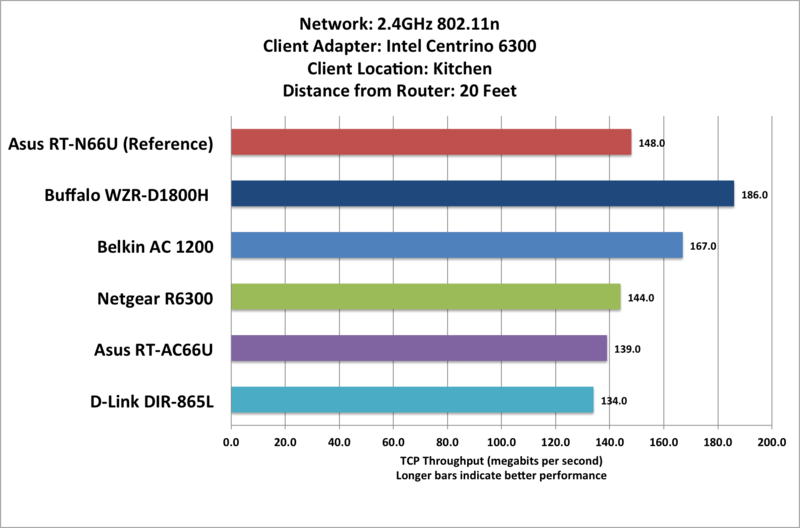 I used an AVADirect laptop equipped with a 2.5GHz Intel Core i5-3210M CPU, 4GB of memory, and an integrated Intel Centrino Ultimate-N 6300 Wi-Fi adapter to run my benchmark tests. 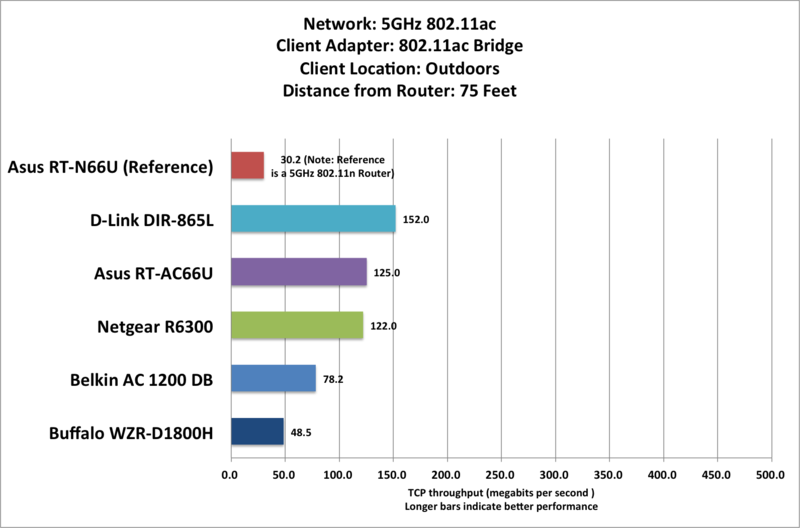 The Ultimate-N 6300 can send and receive three simultaneous 150-mbps spatial streams (450 mbps in total); most adapters are limited to handling two (300 mbps in total). This was all the streaming I needed to evaluate the WZR-D1800H's 802.11n performance (on both the 2.4GHz and 5GHz frequency bands). 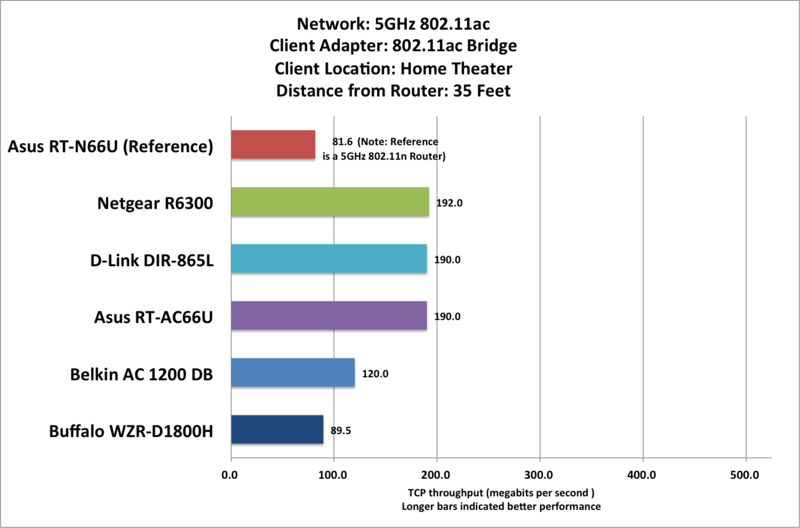 To measure the router's 802.11ac performance (on the 5GHz frequency band), I used Buffalo's AirStation AC1300 wireless ethernet bridge, connecting the bridge to the AVADirect's ethernet port. The bridge looks almost exactly like Buffalo's router from the front. It has a four-port gigabit switch in the back, but it lacks a WAN port. The WZR-D1800H delivered disappointing performance at close range, with the client 9 feet away from the router and in the same room. 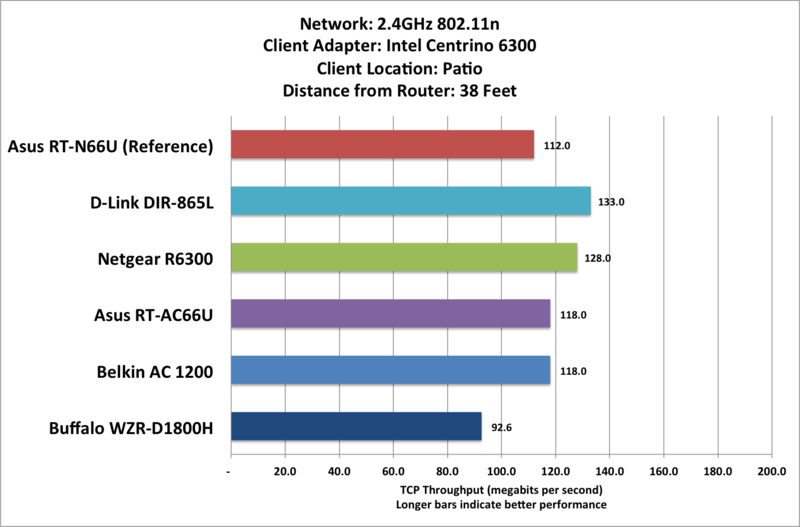 It might sound odd to hear a wireless TCP throughput of 270 mbps described as disappointing, but the Asus and Netgear routers delivered TCP throughput approaching 500 mbps. Only the two-spatial-stream Belkin AC 1200 delivered slower performance than Buffalo's router at this location. As you can see in the chart below, things didn't improve any when I moved the client and the wireless bridge to the kitchen. 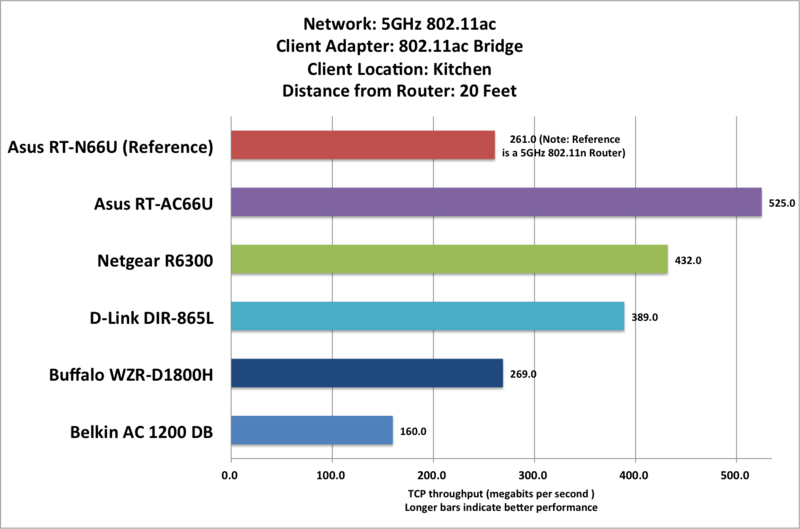 Here again, the WZR-D1800H finished ahead of only the Belkin AC 1200 DB, delivering wireless TCP throughput at 269 mbps, compared to the Netgear's nearly 500 mbps and the Asus's astonishing 525 mbps. The next two benchmark runs took place inside my home theater. This is a room-within-a-room design, with four walls of 2-by-4 framing and drywall inside four walls of 2-by-6 framing and drywall, with about 6 inches of dead air and fiberglass insulation separating them. My intent was to optimize the room's acoustics, not to build a Faraday cage, but many lesser routers and other wireless devices have had trouble penetrating it. However, none of the 802.11ac routers I tested had any difficulty reaching the client in this room. 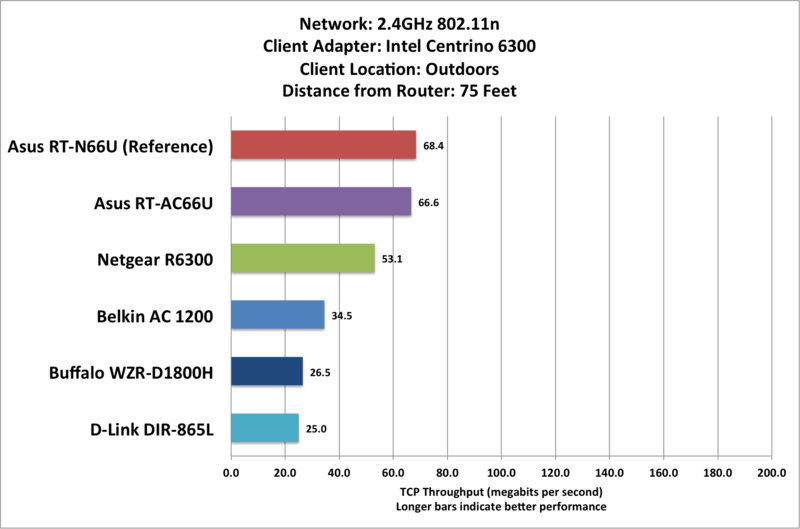 On this benchmark, Buffalo's router finished dead last, delivering less than half the throughput of its top-performing rivals. 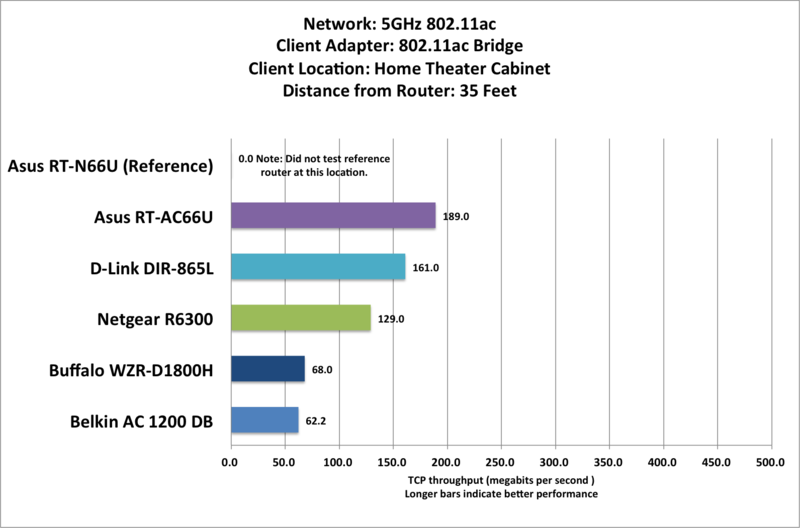 Since many people will want to connect the gear in their home entertainment system to an 802.11ac network, I decided to measure TCP throughput with the wireless bridge inside the built-in equipment cabinet in my home theater (the floor-to-ceiling, wall-to-wall cabinet is constructed from cabinet-grade plywood, including the back). The WZR-D1800H's performance looks a little better in the chart below, but only because the Belkin shed so much throughput on this measure while the Buffalo held steady. I was able to wirelessly mount and stream a Blu-ray ISO image of the movie Spiderman 3 from a Windows Home Server 2011 machine in my home office to a home-theater PC in that entertainment center, including its high-definition soundtrack. As the chart below depicts, the WZR-D1800's performance improved considerably when I moved the client and the wireless bridge to the first of my two outdoor test locations—an exterior patio enclosed by three walls and one half wall with glass windows. In the real world, I doubt that anyone would try to set up a media bridge outdoors because dragging the bridge and finding an outlet (and likely an extension cord) are too inconvenient. 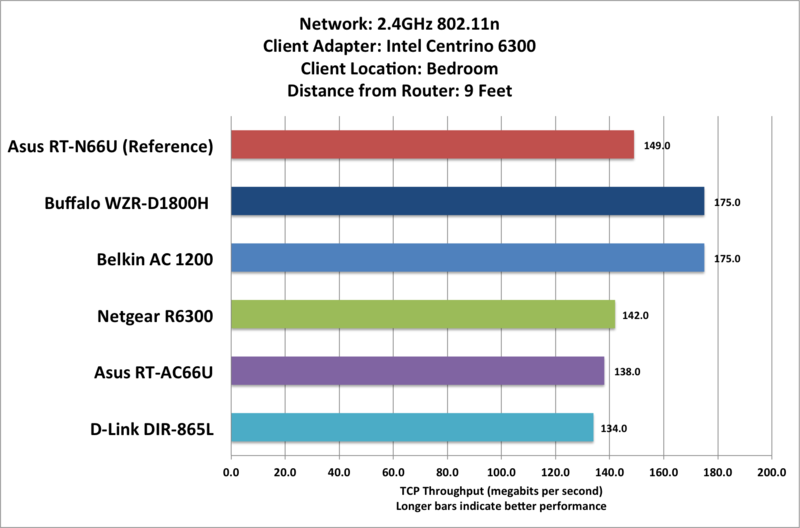 On this measure, the Buffalo presented no threat to the top two routers I tested, the Asus RT-AC66U and the Netgear R6300. When I moved the client and bridge to my most challenging outdoor location, separating them from the router by 75 feet, with three insulated interior walls and one insulated exterior wall (clad on one side with fiber-cement lapboard) between them, the WZR-D1800H slipped to last place behind the Belkin AC 1200 DB, delivering TCP throughput of just 48 mbps. As I mentioned earlier, Buffalo's router had no problem with channel bonding once I configured it to do so. As a result, the WZR-1800H delivered the fastest performance at close range, with wireless TCP throughput of 175 mbps when the client was in the bedroom, and 186 mbps when the client was in the kitchen. The good times didn't last when I moved the client and the bridge outdoors. Buffalo's router delivered a last-place finish from the patio, and it placed next-to-last on the even more-distant picnic table. 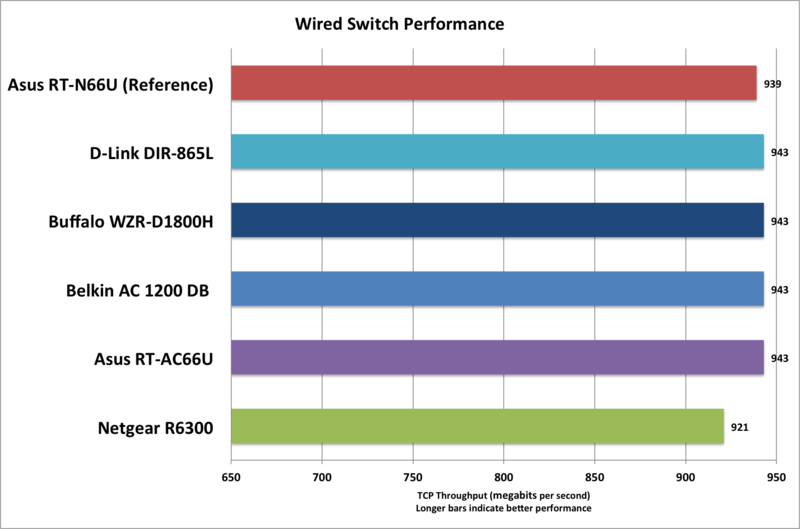 The WZR-1800H's four-port gigabit ethernet switch performed as expected, delivering TCP throughput of 943 mbps, as did three competing routers. If you don't mind its inability to support USB hard drives formatted in NTFS, Buffalo's WZR-D1800H delivers better value than Belkin's AC 1200 router. Both models carry street prices of around $160, as does Buffalo's AirStation AC1300 wireless bridge. 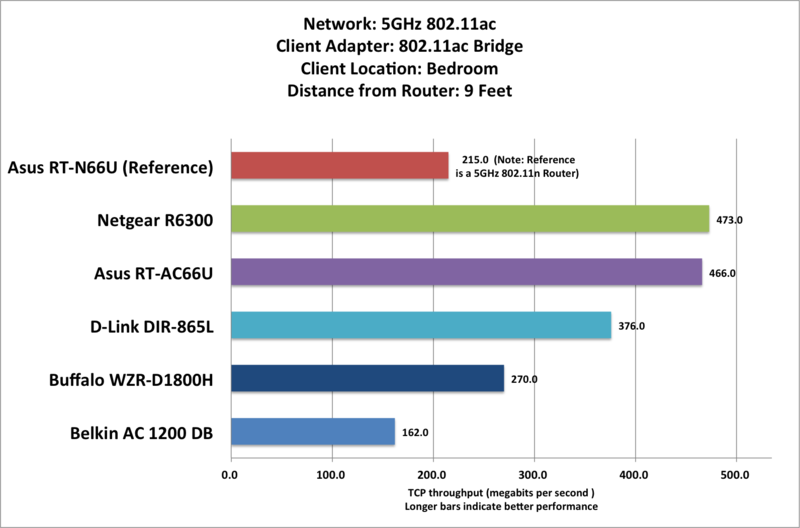 Belkin's 802.11ac bridge hasn't reached the market, yet, and its absence sharply curtails that router's usefulness. Moreover, Belkin's router and bridge support only two spatial streams on each wireless network. So if really want an 802.11ac router, and your budget limits you to an outlay of $160, Buffalo has one for you. Buffalo's WZR-1800H delivers more bang for the buck than Belkin's AC 1200, but that's not really saying much.